Shortly after the iPhone 6 hit the market last year, Apple had to answer to reports that its new phone was bending by mistake. The fuss soon died down. But technology that allows phones and tablets to bend -- by design -- is taking its first steps into the market. Chicago startup Polyera has spent 10 years making screens that don't just curve -- it's producing displays that you can twist, bend and roll up like a yoga mat. Makers of wearable devices are the first that Polyera believes will embrace truly bendable technology. To prove its concept, Polyera is developing its own "Wove Band," a long, rectangular display that you can curve around your wrist like a snap bracelet. The prototype Wove Band feels as much a wearable as it does a fashion statement. The band uses such a low amount of energy that even when you're not interacting with the screen, it can display artsy patterns or designs. 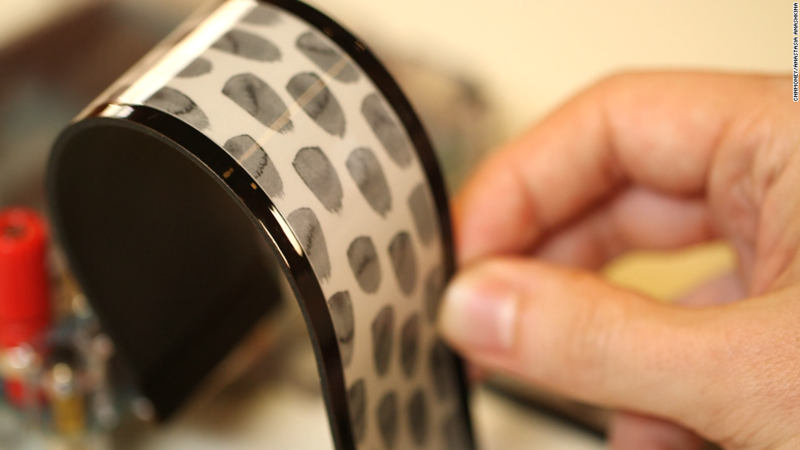 The band uses black and white e-ink from Taiwan, as opposed to a colorful display which would consume more power. Tap the Wove Band with your finger and you can change the screen to display weather forecasts, headlines or email. The company envisions its own system of apps and services, similar to iOS or Android, to provide content for the product, which is slated for release in 2016. Whatever progress companies like Polyera make, Apple and Samsung will undoubtedly be keeping a close eye out. What was once an accident -- #BendGate -- is likely to someday be a key product feature. Watch: Is the iPhone 6 bendable?